Holdfast: Nations At War has been updated. Rain fiery hell on allies and foes alike with the all-new rocket artillery! 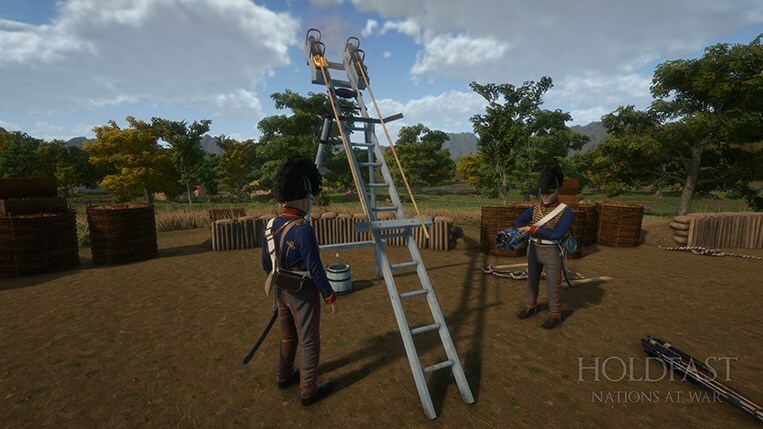 Carry ladders through the ongoing onslaught and scale those towering walls in an attempt to capture a fortification before the artillery makes its first breach. There’s plenty more to look out for in this update! Exclusively available for the British Empire, the rocketeer class has been included in the empire’s army selection of classes. You’ll also find that round shot fired from field guns now bounces off the terrain. Have a read at our latest blog post for all the details. Before you do so, take a quick look at the trailer for this gameplay-oriented update. Intended for long range bombardments, rockets can be relatively inaccurate. Fear not, however! You’ll be able to send rockets flying at a relatively fast pace and one of them is bound to hit your intended target. We always place team-play at the forefront with the use of artillery pieces and the rocket launcher is not an exception to the rule. Well trained crews are sure to triumph over others. Here are some of the steps a crew must go through to operate the rocket launcher. From moving it about on the field of battle to sending your very first rocket flying its way. Nearby the spawn location of either faction, you’ll find a rocket launcher present. These launchers can be moved around on the battlefield as you can already do so with cannons. Look at either end of the packed launcher and press ‘E’ to take control over the launcher. A secondary player can interact with the launcher to assist with moving it around the field of battle at a faster pace. Look at the back of the launcher then press the ‘E’ key once to do so. Move the rocket launcher to your desired location then drop it by pressing the ‘E’ key once. While the launcher still retains its packed state, look at the box interaction icon and hold down the ‘E’ key to unpack it. Unsure about the location you’ve placed your launcher at? Go ahead and pack the thing up to carry it once more. Hold ‘E’ while looking at the box interaction icon to pack the launcher. Providing full control to the crew over the relative direction to send rockets flying towards, launchers can be aimed directly after they have been unpacked. Look at the back of the launcher where the crosshair interaction icon is present and press ‘E’ once to aim the launcher. Search for a rocket stack close to your vicinity then interact with it by pressing the ‘E’ key once and you’ll be presented with a user interface that’ll allow you to equip a shell rocket. Similar to what can be done with an ammo box, rocket stacks can also be carried around by the rocketeer or cannoneer classes. Be sure to have one close to the launcher’s vicinity! Load up the rocket launcher with an explosive shell rocket by looking at the right or left emplacement on the launcher and holding down the ‘E’ key. Maximise the launcher’s rate of fire by having two players load rockets on either emplacement at the same time. Launchers loaded with rockets are also prone to explode if destroyed. It’s not a delightful experience if you’re on the receiving end of this so you better watch out. Ignite the rocket by looking at the rocket loaded on the emplacement by pressing the ‘E’ key once and wait until it fires away. If you’re lucky enough to hit your target, you’ll send those poor fellows flying away with a hint of explosion. Rocketeers are the latest addition to the already growing selection of classes available in Holdfast: Nations At War! Staying true to their history, this class is exclusively reserved to the British Empire. They come equipped with a spyglass, a sword and a pistol. All of these tools will surely come in handy in your efforts to bombard targets at a distance. Rocketeers also have priority over the use of rocket launchers followed by cannoneers. Round shot fired from field guns will now bounce off the terrain decimating through enemy lines. Once a shot loses its momentum, it will also continue rolling on the terrain giving you a better indication of where it has landed. Carriable Ladders. Scale The Walls! Be the first in line for the forlorn hope! Your chances of survival are slim but someone must perform the glorious deed. Carry ladders close to a fort’s wall then raise them up to create additional entry points for the assaulting allied infantryman. Here’s how it all works out. Nearby spawn locations you’ll find multiple ladders that can be carried around. Locate a ladder then press the ‘E’ key once to start moving it around. A secondary player can assist with carrying the ladder. This will provide an additional boost in speed at which the ladder can be moved. This can also be done by pressing the ‘E’ key once while looking at the ladder. White shaded ladders present next to various fortifications and other buildings mark down the location for where a ladder should be placed. Once you have moved nearby one of these markers while carrying a ladder, you will receive a notification informing you that the ladder can be placed by pressing the ‘E’ key. Raise the ladder by pressing the 'E' key. Let the capturing of the fort’s walls ensue. Looking for a good bunch of fellows to play the game with? Do join our Discord! 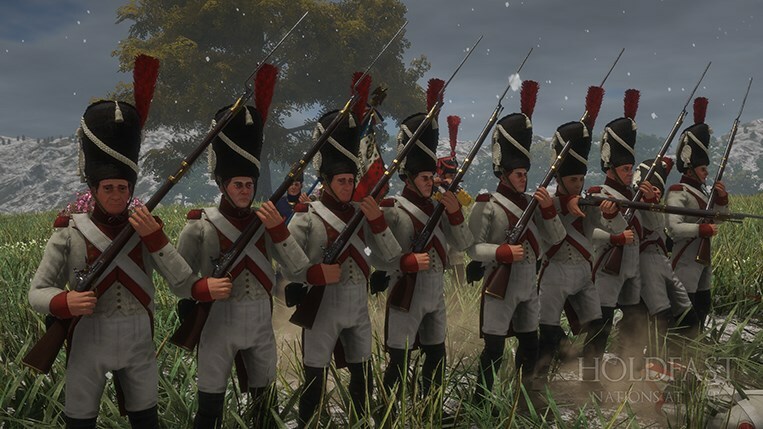 Linebattle events were players are encouraged to play in formations relevant to the Napoleonic era are hosted by the community through the week. Discord is also a great place to be to stay in touch with the game’s development. Feedback is always greatly welcomed. We look forward to seeing you there! Here’s a detailed changelog containing all the new features, quality of life additions and fixes you’ll find in this update. - Rocket Launchers! Intended for long range bombardments, rockets can be relatively inaccurate. Fear not, however, you’ll be able to send rockets flying at a relatively fast pace and one of them is bound to hit your intended target. » Launchers can be found on most of the current maps including plains maps intended for organised play. - A New Class. Rocketeer! Staying true to their history, this class is exclusively reserved to the British Empire. They come equipped with a spyglass, a sword and a pistol. Rocketeers also have priority over the use of rocket launchers followed by cannoneers. - Cannonball Bounce! Round shot fired from field guns will now bounce off the terrain decimating through enemy lines. - Carriable Ladders! Carry ladders close to a fort’s wall then raise them up to create additional entry points for the assaulting allied infantryman. Carpenters have priority over the use of ladders. - Fixed an issue which caused players aiming a mortar to retain some of their player’s visuals obstructing the camera. - Fixed an instance were players would join their previously selected server is they pressed the ‘Enter’ key while searching for a server or changing their name. - Attempted fix towards an issue which resulted in the rain sounds cutting off. - You are now able to auto move rocket launchers, ladders and cannons by pressing the ‘NumLock’ key. - You are now able to separately control artillery related audio sounds through the ‘Artillery’ audio slider. There’ll be more gameplay-oriented additions and improvements to existing core mechanics coming your way soon. Once again, we thank you for your support and until next time, may good health be yours. We’re working on the next update. Discuss this blog post here. © 2016 Anvil Game Studios. We are a community driven team.